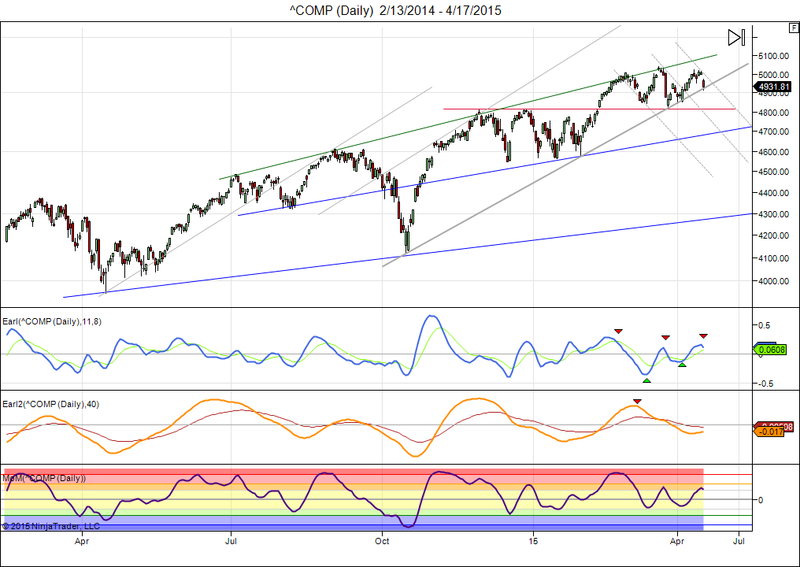 The Nasdaq remains stuck within a huge narrowing wedge. A breakout (up or down) will be inevitable sooner or later. The most recent rally in the Nasdaq has petered out just short of its March highs, and now the Earl and MoM indicators are turning down already. The slower Earl2 remains flat near the zero line, so can go either way from here. This is not the kind of setup I want to buy. Friday’s dip has taken the Nasdaq down to the lower border of the wedge. It may try to hold on for a few more days, but with indicators turning down and a new lunar red period starting later this week, we have an elevated risk for a sudden drop. The 4800 level is still a major support, and below that it would go down to 4700 quickly, with 4550 the next major support. This doesn’t mean a drop *has* to happen, but it’s just an unattractive risk/reward ratio to be long at this point. Many people like to watch the VIX index, also known as the “fear index”. Personally, I have never found the VIX to be useful. At the most it is a concurrent indicator, it has no predictive value. Yes, the VIX goes up when there is panic in the market. But the VIX (~fear) being low doesn’t mean the market is going to panic anytime soon. Sometimes the VIX is low (and stays low) because volatility is and stays low. The VIX has a little brother in the SKEW index, and that one is more interesting to watch. Here is a good introduction on the SKEW. The SKEW index is calculated on the basis of far out of the money options (with average duration of about 30 days), and is specifically designed to measure perceived “tail risk”. E.g. if many investors are afraid that the market may crash, they can buy some protective put options at strike prices that are 10% below the market. Those options are usually inexpensive and in the case of a sudden drop those option can become very profitable bets. If there is a lot of demand for this kind of “crash insurance”, then the premiums of those options rise more than rest of the options spectrum, and that gets reflected in a higher SKEW index. So, basically, when the SKEW is high it tells us that a lot of crash insurance is being bought, and when the SKEW is low it means that investors are buying less insurance (for example because they feel safe that the market will not drop in the next month). But as an old trader used to say: “In the stock market it never rains when everybody is wearing boots”. The market will rarely crash when “everybody” is loaded up on crash insurance. It would take highly unusual news to create the necessary selling to get a crash. Because the people who have crash insurance do not need to sell (they are protected), and those who sold the crash insurance have no incentive to sell either (because that would be like shooting themselves in the foot on purpose). Crashes are generally caused by (small) investors panicking, and they are less likely to panic if they own crash insurance in the form of out of the money puts. During the 1990s bull market the SKEW averaged around 115. A few brief panics in 1997 and 1998 made investors more aware that the market was becoming risky, so more crash insurance was being bought, lifting the SKEW index above 120 with peaks above 140. Note that this was the equivalent of buying boots after the flood. Most of this crash insurance expired worthless because the market kept rising. So, the good folks who sold those out of the money put options were raking in nice premiums month after month. And the people who bought crash insurance gradually stopped doing it, because it never paid off. 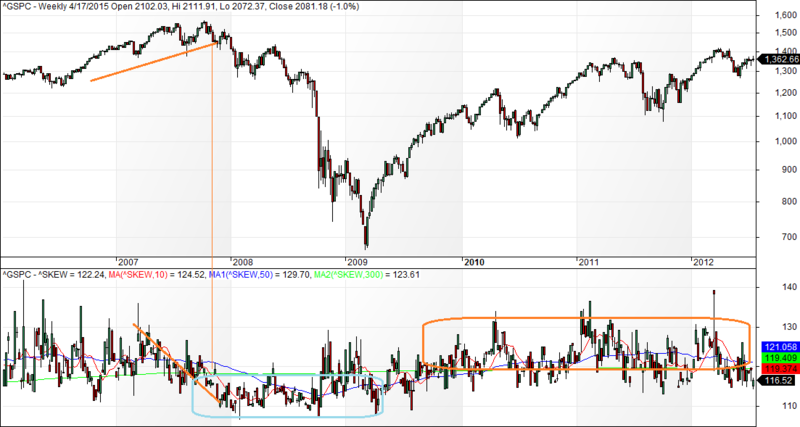 A few dips in late 1999 again pushed the SKEW above 120, but lower than at its peaks in 1998. And by early 2000, with the market at record highs the SKEW started dipping below 110, its lowest level in years. For some reason investors stopped buying crash insurance at the top. Perhaps they felt too good. Fear disappeared and complacency took its place. Buying out of the money put options had not worked for years, and investors gave up on it. And when nobody had boots, that’s when it started to rain..
By the end of 2007 the SKEW had dropped below its historic average again, and the demand for crash insurance remained low (as evidenced by low SKEW) for most of the slide into the 2009 lows. 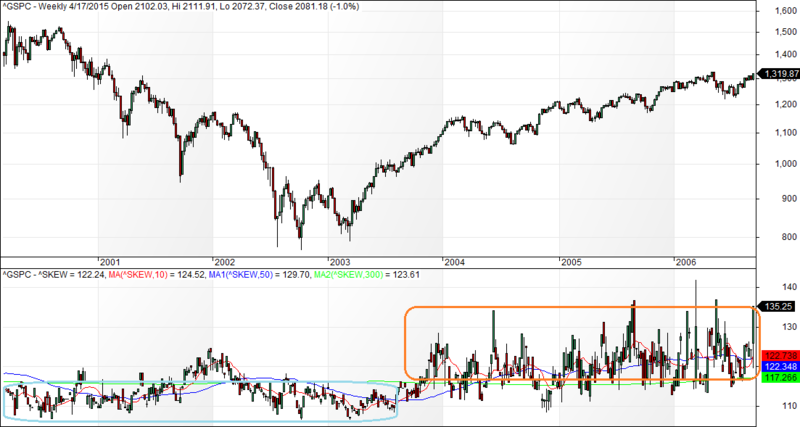 In August 2008, right before the most dramatic part of the crash, the SKEW was even trading below 110. 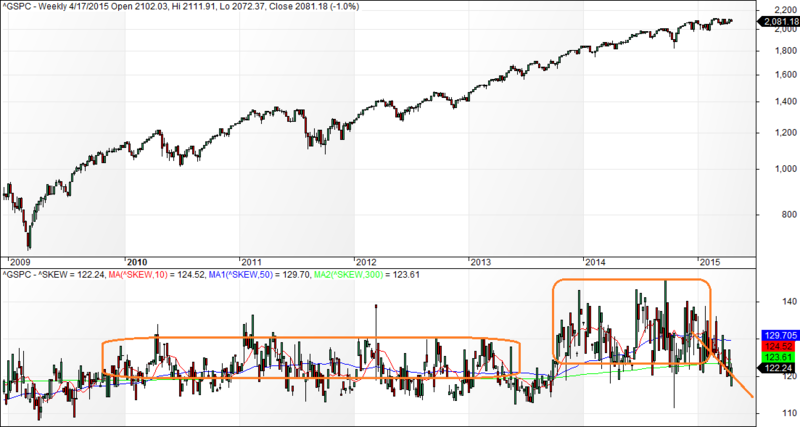 In late 2013 the SKEW started trading at even higher levels, with occasional spikes above 140. That hasn’t happened before. Apparently, with the market at new record highs, plenty of people became convinced that a crash was coming again. Having seen big losses twice in the recent decade, many traders may have been determined to not get caught in the next crash without insurance. Fear ruled, despite record highs. But once again, all those premiums paid for out of the money put options have only been profits in the pockets of those who sell those options. The market has kept going up in 2014. But since the beginning of 2015 we suddenly see a strong downtrend in the SKEW. This is the first sign that we may be getting into a new stage of complacency. Markets are at record highs (just like in 2000 and 2007) and the SKEW drops to lows suggesting that crash insurance is no longer in vogue. That can be a deadly combination, so we want to keep an eye on the SKEW. And if it goes on to drop to 110 for extended periods, then we will know it is that time again. This entry was posted on April 20, 2015 at 11:03 am	and is filed under Financial Astrology, Market Commentary. 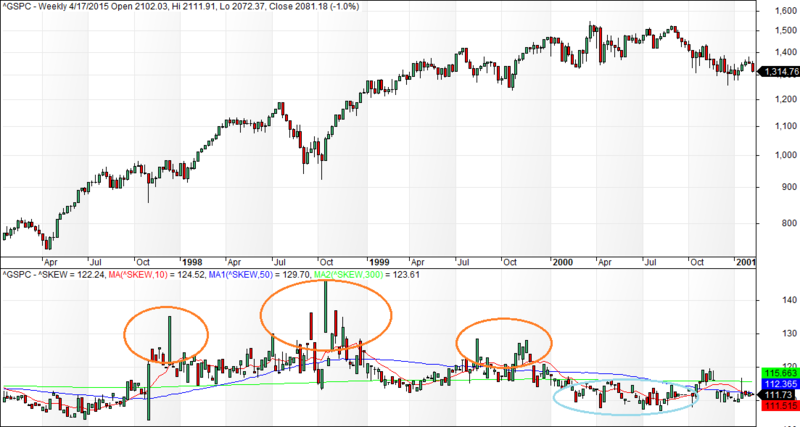 Tagged: lunar cycles, SKEW, VIX. You can follow any responses to this entry through the RSS 2.0 feed. You can leave a response, or trackback from your own site.